Have you ever been drawn to the scent of a stranger’s ‘musk’? Does the sound of their voice drive you mad with desire? Why do some touches feel ‘electric’? Do the senses determine compatibility? Join us March 18th to find out! 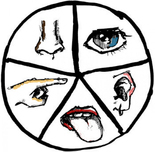 *Speed-dating for the Senses (and the sensitive)* is an evening of experiments investigating what role the five senses play in determining attraction and compatibility between mates. This study applies groundbreaking methods developed by Scientists for Love’s head scientists, Leigh Kotsilidis and Amy Chartrand. * The target age range for this experiment is 18 – 30. However, we also welcome participants outside this age range who are interested in connecting with people within this age range. * This event is logistically designed for participants seeking heterosexual connections. That said, this event and Scientists for Love welcome all preferences with an open mind and an open spirit. Scientists for Love’s mission is to host community events with a light-hearted approach to making new connections through scientific inquiry. With zero pressure, the focus at all Scientists for Love experiments is on creating an atmosphere that is generous, encouraging, and fun. And after all that science – it’s party time with $ drinks (first one’s on us)!! !